There's a pasta dish which, up until a few years ago, was mostly known in Rome to Romans who enjoy simple Roman dishes. The name is Casio e Pepe, which simply means cheese and pepper, in certain Romain dialects. 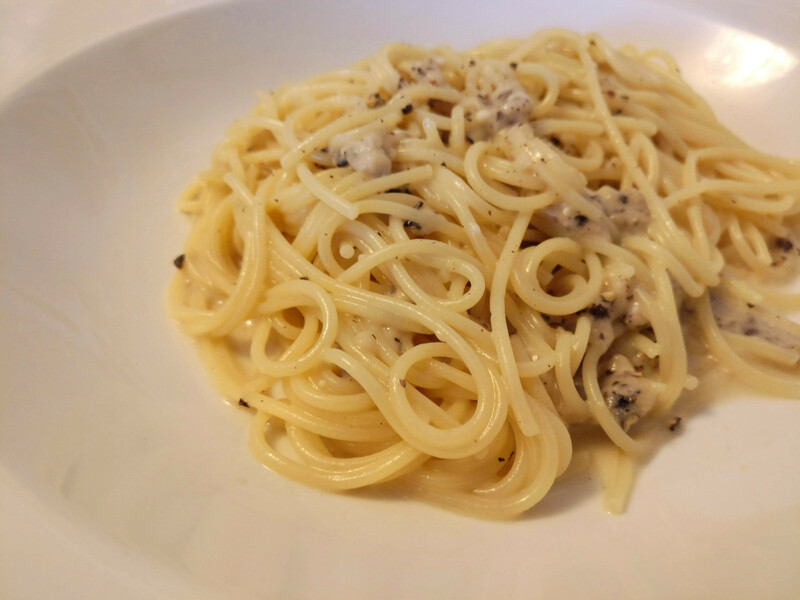 A cacio e pepe recipe stands or falls by its method, the alchemy that turns dry cheese and water into creamy sauce. I have no problem believing that all the recipes I try work well in the hands of an expert – my job, I think, is to work out which one gives the rest of us the best chance of success. So, go ahead and read the whole thing. PS: The dish pictured isn't Cacio e Pepe. It's a somewhat unorthodox Carbonara. Don't fight me. Update: I made it. I used too much water, so the sauce didn't thicken the way I want it. Fortunately, some Pecorino is still left, so I'll try again next week. The lumps are bigger pieces of Pecorino that were too soft to grate.